Although GoDaddy is better known for being the largest domain name registrar, the company also offers reliable web hosting service for all categories of users, from micro businesses looking for small company websites to large web applications looking for dedicated server hosting for their website, you will find a suitable GoDaddy Hosting plan. 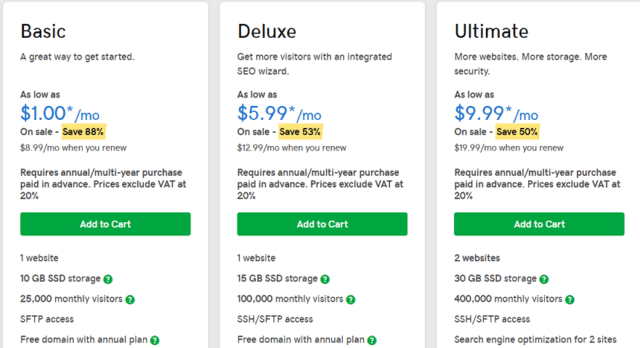 GoDaddy offers a more transparent web hosting. 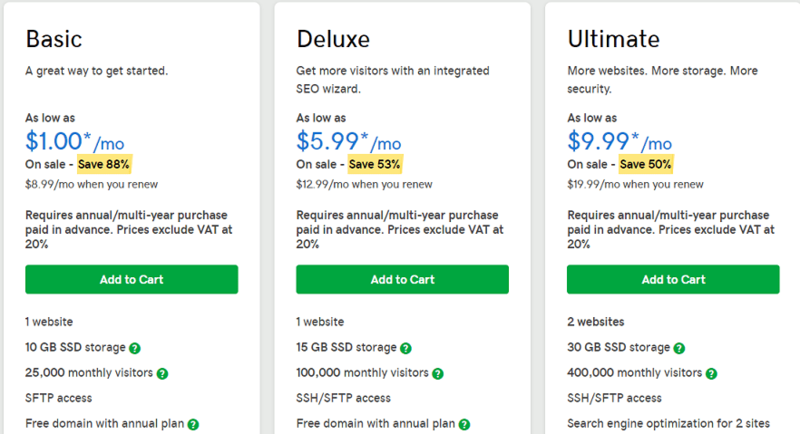 While a lot of web hosting companies hide details of the limits to the server resources they allocate to their customers, GoDaddy tells you what to expect by sharing some of this limits. Each GoDaddy hosting plan provides information about storage, database, email accounts, and bandwidth limitations. For example, the Economy web hosting plan from GoDaddy offers 100GB storage space, unlimited bandwidth, and one website. So, you know what to expect from the web hosting plan right from the start. A lot of web hosting companies offer what they call unlimited web hosting, yet there are hidden limits, which you will only find out when you reach them. GoDaddy hosting offers both Linux and Windows hosting. So, whether you are developing for PHP or .NET, GoDaddy has a solution for you. They offer reliable web hosting with 99.9% uptime and if you have an issue, 24/7 email, web, and phone support is available. GoDaddy is also recommended if you are looking for Best WordPress Hosting or Best VPS Hosting. Of course, you might just decide to go for their world-class Domain Name Registration. In case you need more server resources or want to setup a web design or web hosting business, GoDaddy also offers Reseller web hosting, Virtual Private Server VPS Hosting, and Dedicated server hosting.